Fabulous 3 bedroom, 3 bathroom penthouse apartment with several balconies and stunning sea views in a quiet location off the main square in Nazare. This beautiful apartment comprises 3 double bedrooms each with a balcony off, two of the bedrooms are en suite and all have fitted wardrobes. 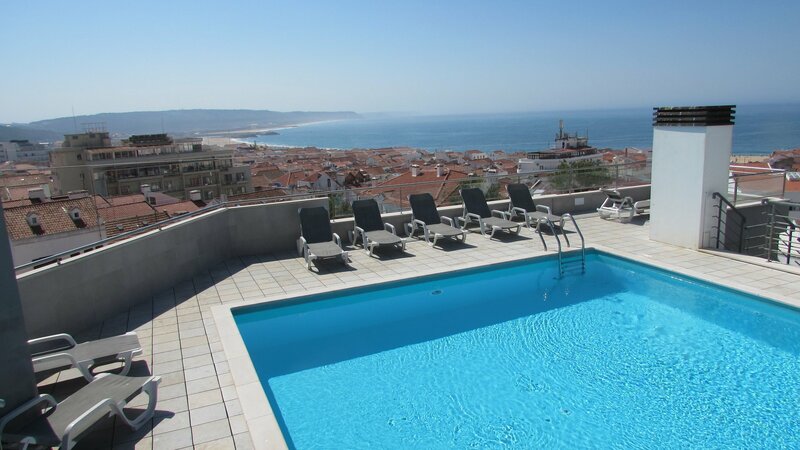 Situated close to the stunning Silver Coast beaches and just a 1 hour drive from Lisbon and the airport. The living accommodation is dual aspect and open plan with a fully fitted kitchen, dining and seating areas and French doors off to the spacious balconies from where you can hear the sea and watch the famous waves of the North beach. Off the hallway is a family bathroom which features a bath with shower over. Extras include air conditioning/heating, central vacuum and surround sound speakers throughout. The exclusive development has been built to a very high standard and finished with polished stone and marble. The roof top swimming pool is accessed by the elevator and has amazing views over the town, beach and sea. There are shower rooms and a leisure lounge for use by residents and their guests. In the basement are two allocated parking spaces. The apartment is in immaculate condition and sold with all furniture.